In Locarno, located in the canton of Ticino, on the shores of Lake Maggiore, 195 meters (640 feet) above sea level, the climate is humid temperate. Winters are quite cold, while summers are warm, and characterized by a good amount of sunshine, but also by quite frequent thunderstorms. On the other side of the Maggia River, we find the nearby town of Ascona. Together with Lugano, Locarno is the mildest city in Switzerland. In the cold half of the year, the wind is generally weak or non-existent, except when the favonio (or föhn) blows, the warm and dry wind that comes down from the Alps and is able to bring clear skies and very good visibility. On the other hand, during the warm semester, the wind is weak or moderate and follows the breeze regime: during the warmest hours the breeze blows from the lake towards the mountains (therefore, from the south), while after sunset and at night it blows from the mountains to the lake (therefore from the north). The rains in Locarno are definitely abundant, since they amount to 1,900 millimeters (75 inches) per year. Winter is the relatively driest season. In spring and autumn, the rains are plentiful in periods of Atlantic depressions because the southern currents are force to climb the Alps and condense. In late spring and summer, thunderstorms in the afternoon or evening are quite frequent (and sometimes intense). During the most intense waves of bad weather, which occur in autumn (but sometimes also in spring), the lake's water may overflow, flooding the lower areas of the city. 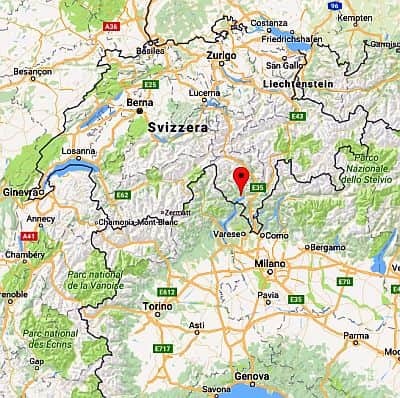 Winter, from December to February, is cold enough, but owing to the warming influence of the lake, it is milder than in the major cities of Switzerland, and it's also milder than the Po Valley. Fog is less frequent as well. There is a moderate amount of rainy days, even though winter is the least rainy season. Snow generally falls at least once every year, and sometimes it can be abundant, but it tends to melt soon enough because it occurs in conditions of southerly winds. In a year, an average of 47 centimeters (18.5 inches) of snow falls. The record belongs to the winter of 1977/78, when a total of 242 centimeters (95.3 in) of snow fell. We can not exclude very cold periods, with night frosts and temperatures around 0 °C (32 °F) or even below in the daytime. However, in these cases the weather is usually dry. The temperature rarely drops below -5 °C (23 °F), though it can happen in the coldest winters; here are some values recorded in the past: January 1985: -10 °C (14 °F); February 1991: -8 °C (18 °F); February 2012: -9 °C (16 °F). However, it is enough to go to the nearby plain of Magadino, east of Locarno, to find much lower temperatures, especially on winter nights, when frosts are frequent, and in the coldest winters, considerably low temperatures are recorded; for example, the temperature plunged to -16 °C (3 °F) in February 2012, to -12 °C (10 °F) in January 1985, and to -17 °C (1 °F) in February 1991. Summer, from June to August, is warm, and often sunny in the morning. The temperature is generally pleasant or at least bearable, in addition, the lake breeze blows. Sometimes an Atlantic front, able to bring some cool and rainy days, can affect this area; more often, thunderstorms can break out in the afternoon or in the evening. We can not exclude some hot days, with highs around 33/34 °C (91/93 °F); more rarely, even higher values can be reached: for example in the exceptional heatwave of August 2003 the temperature reached 38 °C (100 °F), and in July 2015 it reached 36 °C (97 °F). The amount of sunshine in Locarno is acceptable in winter, when there are sunny days alternating with cloudy periods (in January there are 4 hours of sunshine per day); in the other seasons, it is not very high, in fact, Atlantic disturbances pass over the area quite frequently in spring and autumn, while in summer, in periods of good weather, cloudiness in the afternoon can form, which can lead to thunderstorms: in July, the sunniest month, there are 8.3 hours of sunshine per day on average (in about 15 hours and 20 minutes of daylight, so the sun can be seen around 65% of the time). 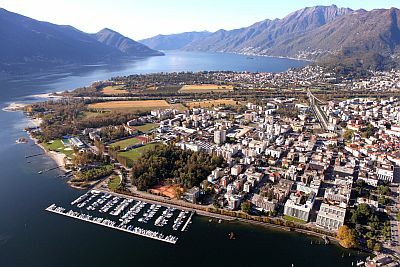 The best periods to visit Locarno are spring and early summer, in particular from mid-April to mid-June. September, too, is a good month. However, you have to take into account some rainy days in both periods. Summer, which is the best time for sunbathing, can be hot, though this rarely happens: usually the temperature is acceptable, especially in June. We recall that there's some chance of thunderstorms in the afternoon or in the evening, in summer and in May. See also the climate of Lake Maggiore.